Last night, I was working on the computer when I heard caterwauling...which is not unusual, because whenever my cat, Gordon, re-kills the fake mouse I bought for him, he lets *everyone* know about it. Then I heard thumping...again not too unusual, but my cat's 15, has thyroid cancer, and has made me believe he is within an inch of death on numerous occasions (can you say drama king?). Then I heard tumbling down the stairs. So either he got so excited by killing a fake mouse that he took a tumble while celebrating, or something else was going on. I go up the first flight of stairs and spied his treasure...one of my brand new artisan-made polymer clay beads! The nerve of him! By then, he was no where to be found, so I hiked up the second flight to my work area...where I found the little imp coveting a stash of beads he had spilled off my bead table...all over the carpet. As I picked up *my* beads, he had to nerve to start screaming at me...no bead is safe. So I found a picture that most suits his criminal nature. This is Bead Enemy No.1! 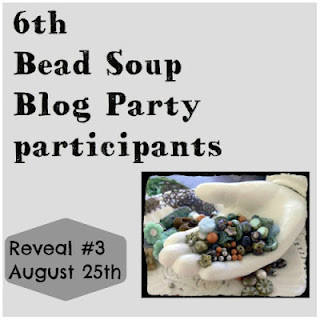 Bead Soup Blog Hop Reveal!! The day is finally here for my reveal in the Bead Soup Blog Hop, hosted by the lovely Lori Anderson! 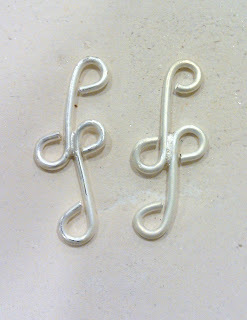 The rules were we had to use the clasp and focal sent to us, though not necessarily in the same piece. We had the option of using the coordinating beads. I love green, but I find that I don't work with it very as a main color, so I was thrilled to see Menka sent me a "green" soup! I wanted to use the blog hop as a way to help stretch my skills, and part of that is being forced to break out of the colors you are most comfortable using! Ironically, the first piece I made, was not "green" but pink! I fell in love with the silver links, and was holding them in my hands when I imagined they would make a good frame for a dangle. I had just picked up some pink acrylic beads that were the juiciest color of pink. 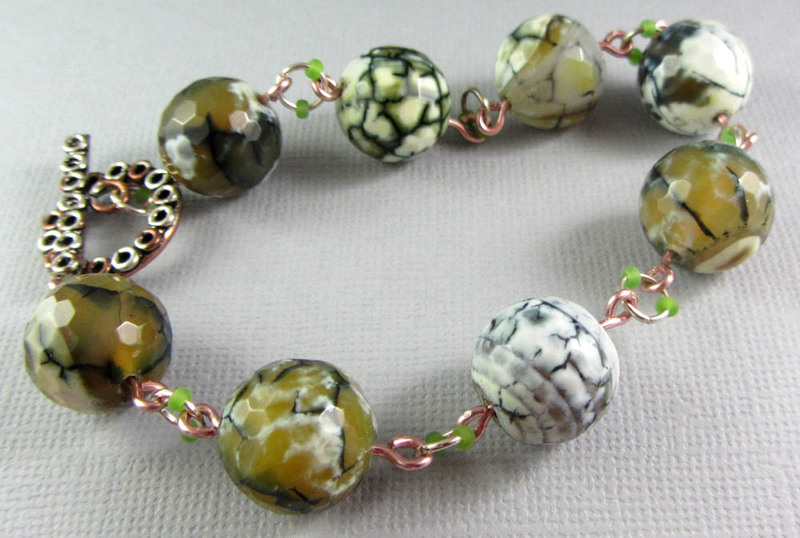 Next, I found myself looking at the larger faceted agate beads, and envisioned them on simple copper wire-wrapped links. However, I wanted a little more color, so I added some green seed beads to the silver jump rings that connect the links. It's subtle, but enough to make the bracelet a bit more interesting. 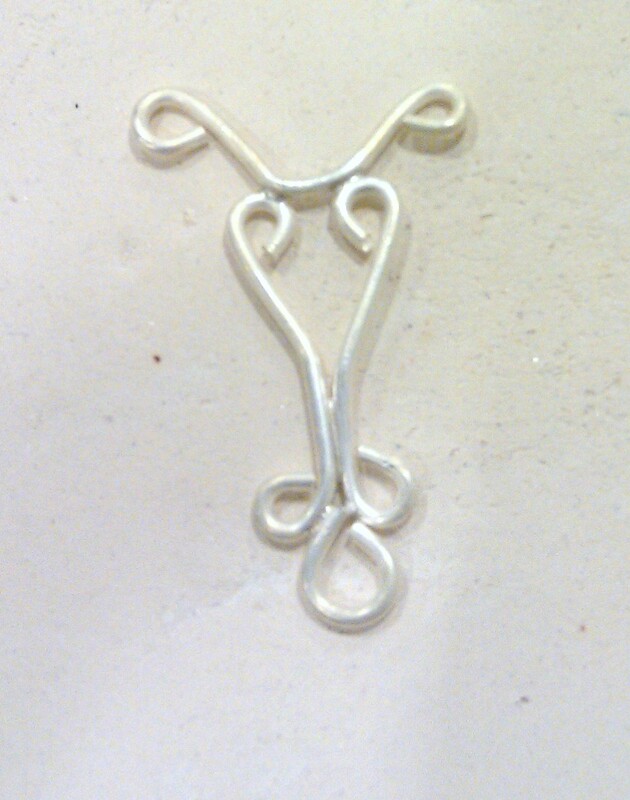 In this piece, I used the silver and copper clasp. The drape of this bracelet on your wrist is so elegant! I struggled a bit with the focal...because of my own limitations in skill. I had tons of ideas, and wished that I could magically do beadweaving, or some funky stitches...I then had a design pop into my head as I was falling asleep last week! I tried wrapping the focal to some gunmetal chain, with more seed beads and some of the small faceted gemstones as well. It looked beautiful in my head...but not so pretty in person. So I pulled it all apart, using a few choice words. I then went back to what I know and strung some seed beads on two different lengths of wire...I wanted an unique drape to showcase the focal. I was going to add a third strand, but when I held it up to my neck to test it, just two strands looked a lot more striking and allowed the focal to be the, well, focal. 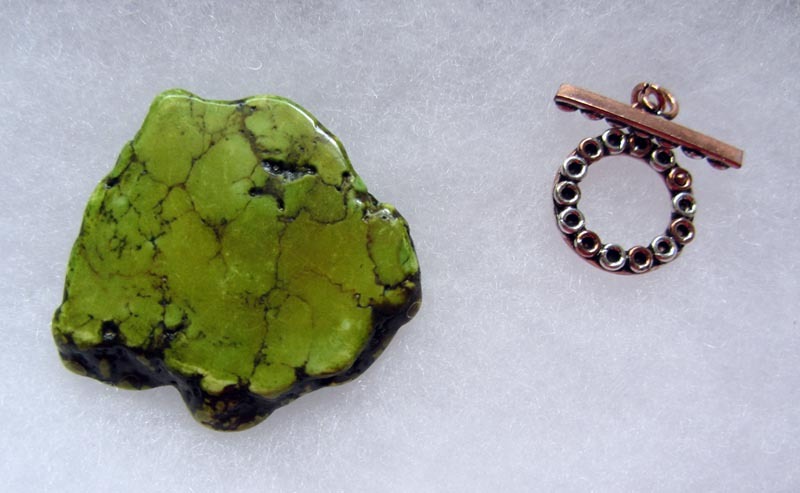 I apologize that the photo isn't as good as the other two pieces--I pulled out my necklace display, and I must have dragged it along something, because it looks like someone took an axe to it! (Note to self: buy new display). So I had to hold the necklace up, so it would drape properly, with one hand, while I took the photo with the other. 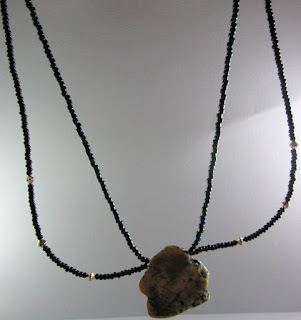 And while it drapes perfectly while on, I didn't want to make you all have to stare at an up close shot of my neck ;) I finished the necklace with the gunmetal chain I had cursed at earlier, and it just goes over your head--no clasp. 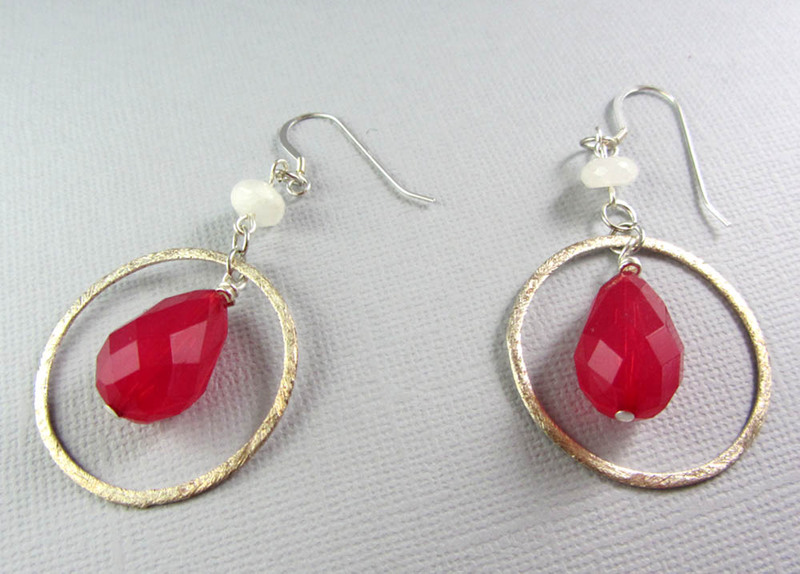 To thank everyone who visits, I am hosting a giveaway of the earrings and the bracelet (two separate giveaways). I am going to hold onto the necklace, because, in my heart, I have a feeling I am going to still work a bit more with it! To enter, just leave a comment waaaay down at the bottom of this post, and make sure you say if you prefer one over the other. I will assign everyone a number, and then use a random number generator to pick the winner on September 1st! Now, please visit the rest of the 3rd reveal participants to see some lovely creations! 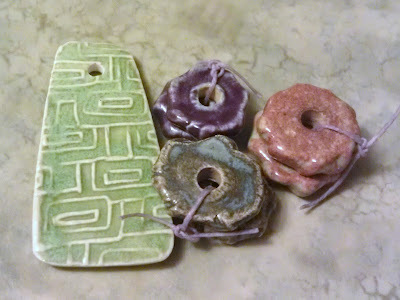 I love Beads of Clay!!!! 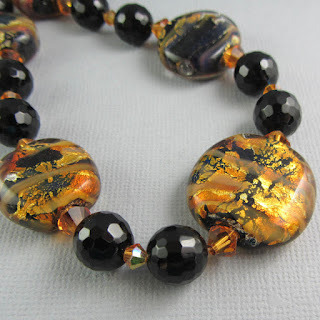 As I blogged last week, I went to Bead Fest this year...and fell in *love* with ceramic beads! 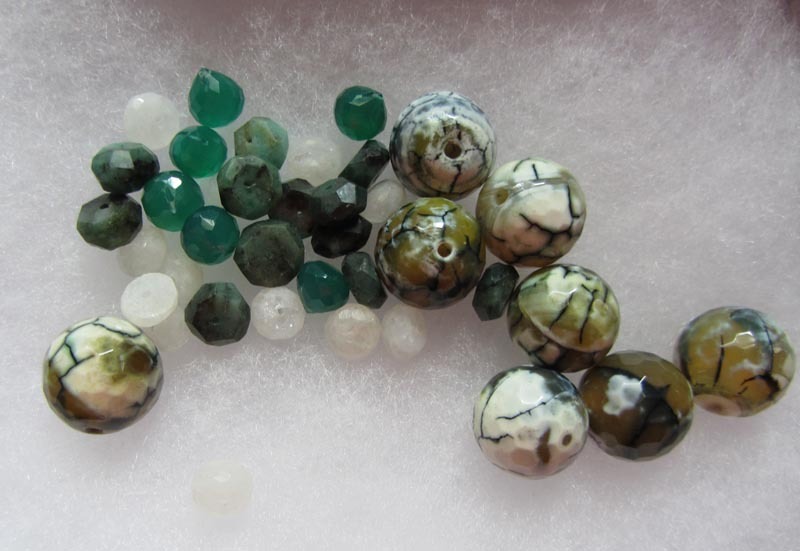 I went to Bead Fest with the intention of buying some handmade beads, because I simply don't have the time to make enough lampwork on my own for the jewelry I create. So this is how I really stumbled for the first time into the ceramic world! My first purchase came from White Clover Kiln...I was supposed to still be in the "overview" mode where I walk to whole show and make decisions after I have surveyed what's available. However, when I stopped at Mary's booth, my self-control finally evaporated. 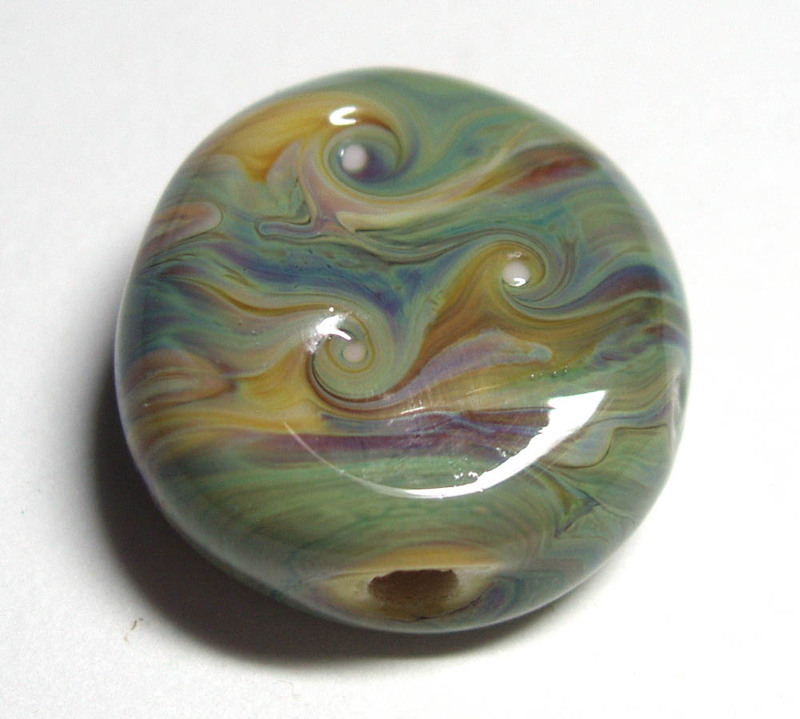 I fell in love with her bead caps, and the delicious colors of her glazes. Next, I knew I had to get back to Suburban Girl Studio...I had set my sights on her Egyptian pharoah and scarabs...but was still undecided on what else to get...because I wanted one of everything. Diana was very patient as I stood there looking...and looking...and looking. I can't wait until she re-stocks her etsy store, so I can get some more of her beads soon! 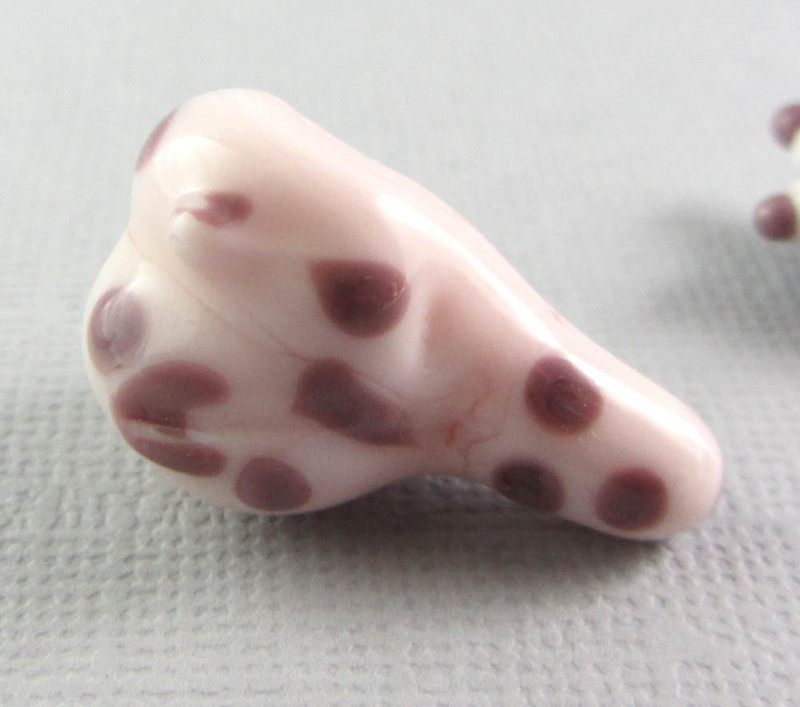 I have had the teardrop beads dancing through my brain the past couple of days, so I think those will be the first I use! By this time, I was running out of time--the show was closing for the day. So I made a couple of mental notes and knew I would be shopping during the break between my classes on Saturday! During the break, I found some very cool bead pairs and a focal by Marsha Neal. The picture does not do the colors justice! 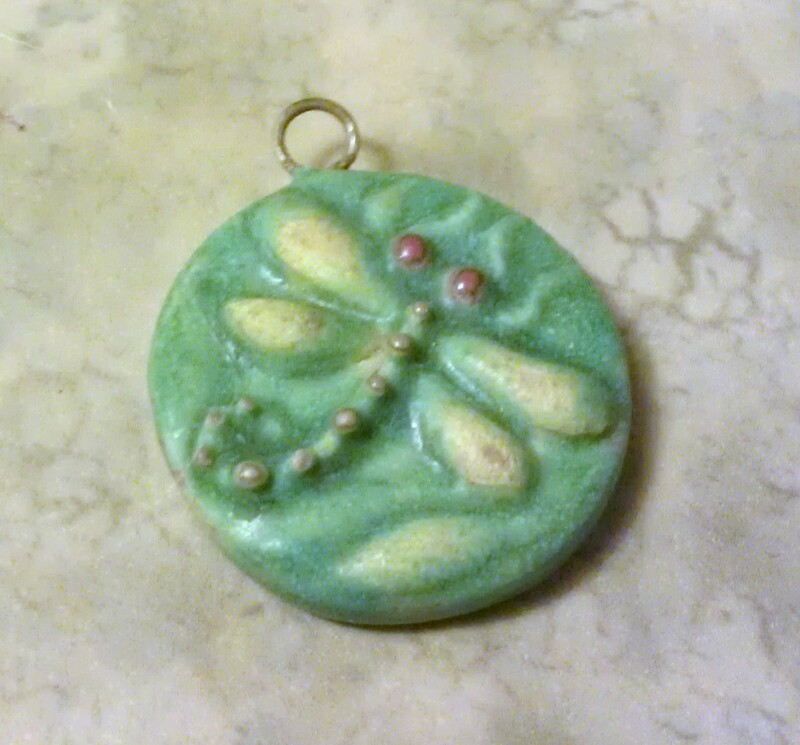 And finally, I had been eying a dragonfly pendant from Joan Miller ever since my first walk-through on Friday. I decided I *had* to have one, or else I really would regret it! So this will be made into my own personal piece! I absolutely love him! I am so happy to have had the chance to buy such beautiful beads from talented artists. The pieces I make with be gorgeous, no doubt! Art Jewelry Elements is hosting a mini-blog hop today...and I'm a little late to the party, as usual, but it was such a fun idea, I wanted to join in. The blog hop is focusing on growth as an artist. It is serving as a good reminder of how far we have all come in terms of skill level, as well as a reminder that we were all beginners at one point! 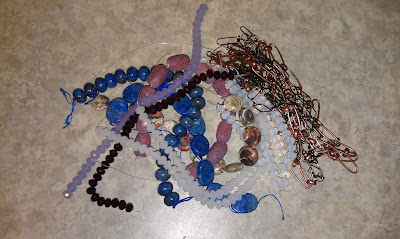 So I dug into my stash of starter beads, and found the actual bag of beads I made at my first class. They are pretty sad, but when I made them, I was soooo awed by the fact that I created them, it was love at first sight! Want to hear something funny? The big pink blob on the left is supposed to be a heart! I haven't made many heart beads in my time, but thank goodness they don't still look like this! I tried to find a picture of a more recent heart, but I realized I only make them in this style when I am doing Beads of Courage purple hearts, and I don't have any made right now. Even funnier, you can't really see it, but on the right side of the heart is a little bump...have no idea what I was doing there. Maybe it's a pacemaker. Even the Tin Man would say,"No thanks!" Even though I have definitely gained a lot of skill since that first day, I have more to learn. In fact, I went to a one-on-one tutoring session today to help correct some of the bad habits I have developed over the years. As much information is out there on the internet, there is no substitute for having a teacher sit next to you and correct and guide you as you work in the flame. So what can I do now? These days I like to make focals, and work in silver glasses. Here's some of my more recent pieces! Hopefully, the more recent ones look a tad bit better! :) Please check out the other artists participating in this blog hop on the Art Jewelry Elements blog! 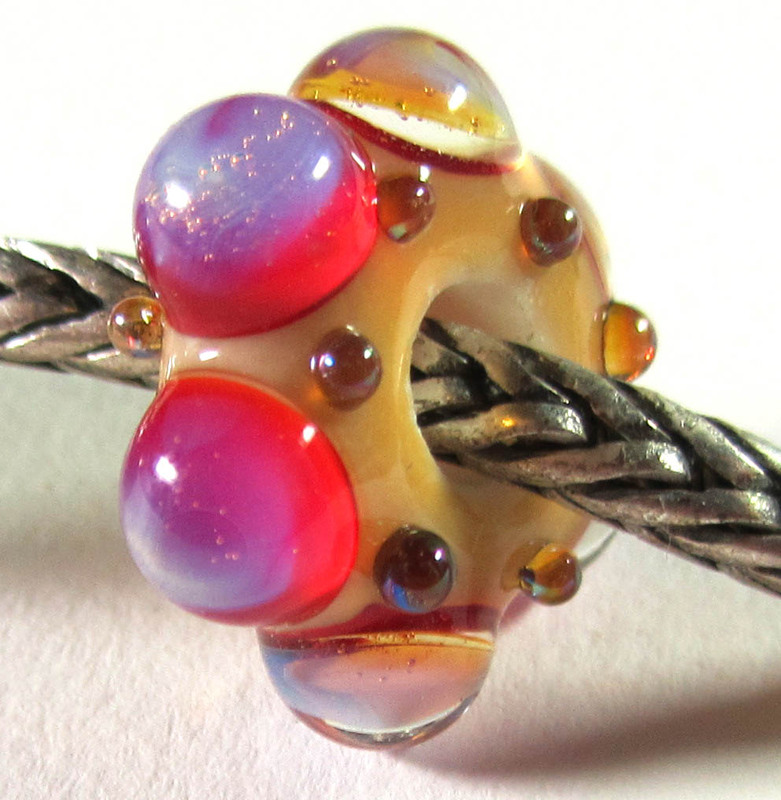 Soldering Silver Bead Fest Class! SUCCESS! I did NOT solder any part of any component to myself. Actually, that would be impossible, but I was so tired, I could imagine it happening to me. 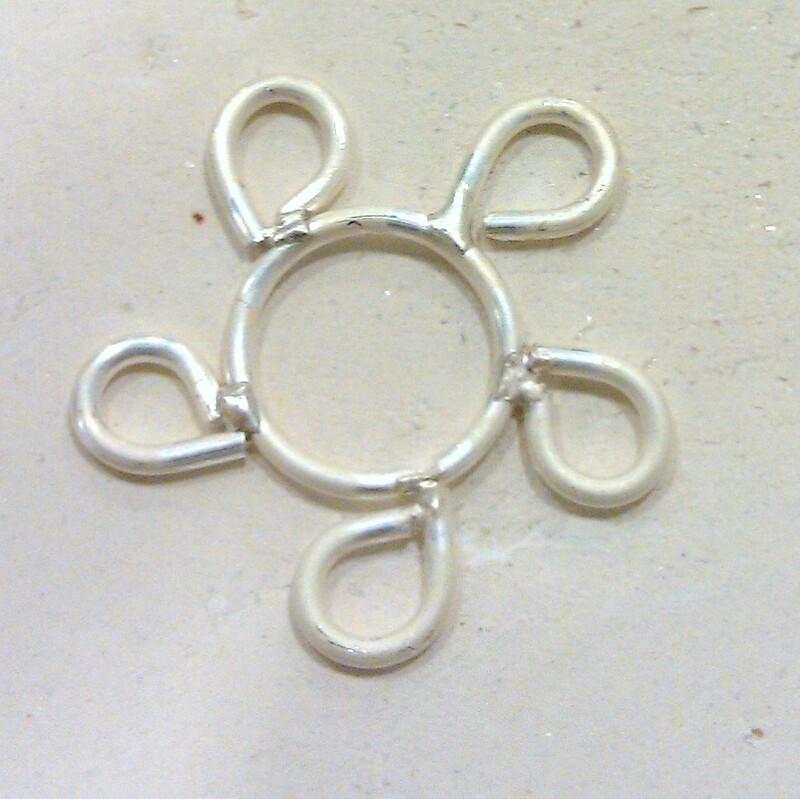 The first class I took at Bead Fest this year was on Soldering Silver Components. 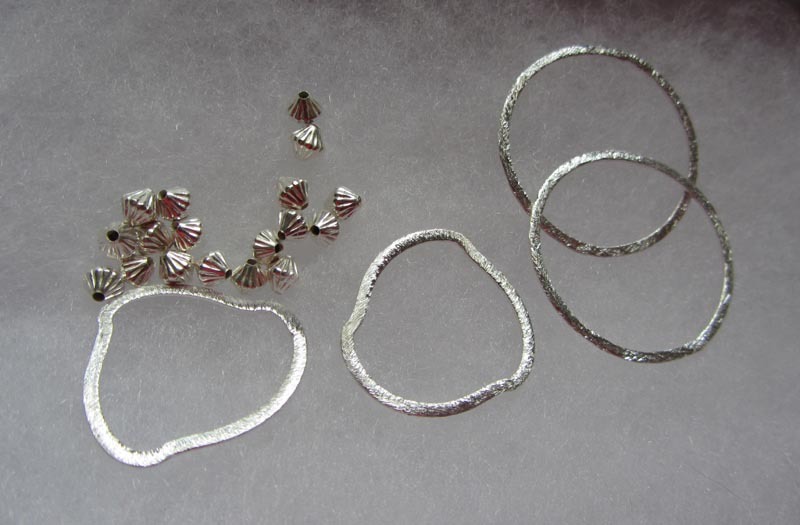 I have wanted to learn how to solder for a while, mainly to create some closed rings for use with my jewelry. When I saw the class, I signed up, even though it started at 8:00 AM. In my summer world, that is the equivalent of about 4:00 AM to the rest of the world that rises early. 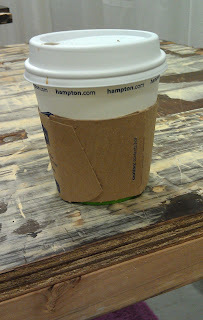 So armed with a coffee that was so small it wouldn't satisfy a toddler, I stumbled my way in to the class. It's as small as it looks. Actually, it's smaller. The teacher of the class was Mark Lareau. I realized that I had a book of his on wire work (I'm a book junkie). All Wired Up was one of the first wire-working books I had purchased. Mark was a great teacher. He had the rare ability to take some technical material and make it so easy to understand. I was able to quickly understand why soldering was a preferred method, versus the use of the "paste" used in many cheaper components. He was also very enthusiastic and open with his knowledge. If you ever have a chance to take a class from him, go for it. The one thing he made us do that was painful was think. At 8:30 in the morning. Have a mentioned I'm not a morning person? But he charged us with the task of designing a piece that needed to be soldered in multiple places, so we could jump into the fire (no pun intended). This is what I came up with in my foggy brain. But the exciting part is that all of the pieces stayed attached to each other! There is definitely a slight learning curve with soldering--it reminds me of lampworking in the sense that you have to *know* your material and at what point in it's heating cycle it's at. The soldered piece; a few gaps, but not too bad! So I got brave and tried to make a flower. Now I would do it totally different if I try one again, but it was good practice in making some shaped rings and trying to solder a lot of points in a small area. You can see that there are some chunks of solder still there. I was so concerned with overheating the silver that I didn't wait for the solder to flow. 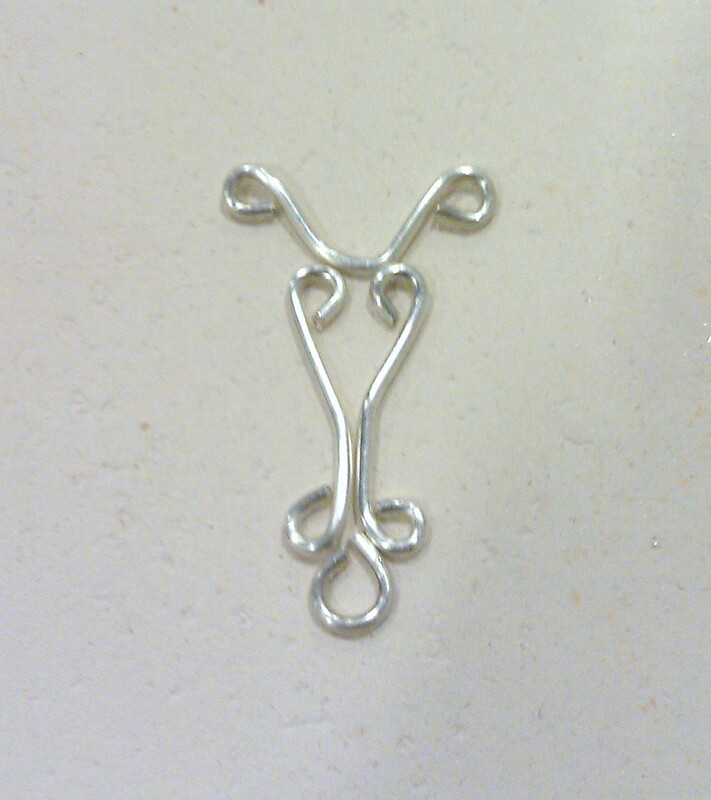 The "flower", even though it didn't work out quite like I had planned, was the best learning tool of the day. This is what I like the most about good classes--they give you a chance to play and experiment and actually learn; sometimes learning what not to do is much more valuable. My final piece was simple. I wanted to make a component I could use to make earrings. 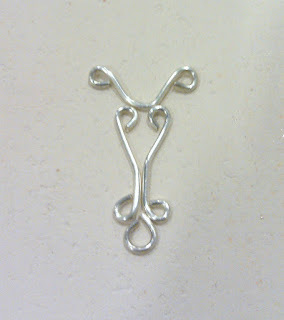 I just soldered together a couple of "S" shapes, and voila! 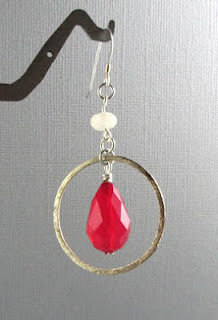 Not too fancy, but they will make a pretty pair of earrings for my personal collection! When I have more energy, I will post about my other class, with Gail Crosman Moore! I am happily at Bead Fest Philadelphia this week...not as a vendor, but as a happy ecstatic buyer! I got to meet some very cool people today, *and* buy lots and lots of beads! If you don't know, Bead Fest is one of the biggest bead shows held each year. It's total Bead Overload. It's more beads than you know what to do with. It's heaven. 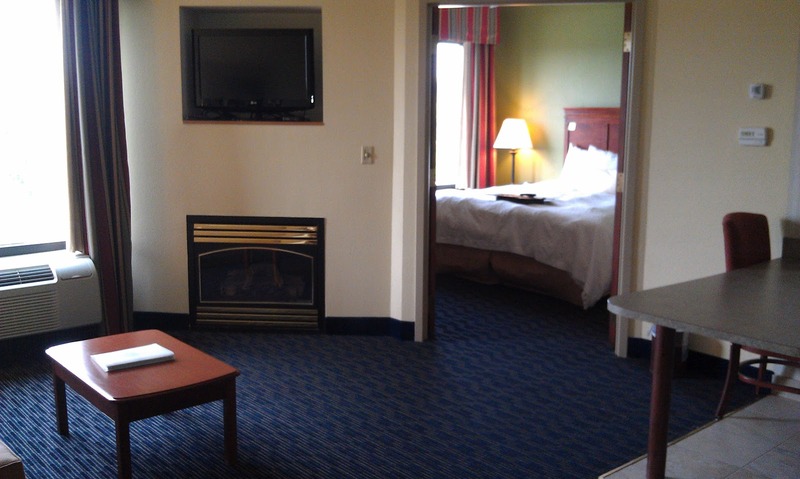 Even my hotel room is amazing. I wanted to make sure I had a fridge, and last time I came, I stayed in a suite, which had a fridge and sink. I figured this hotel room would be similar. Wrong! That. is. a. fireplace. I was seriously tempted to crank up the air condition so that I could snuggle in front of the fire...but that would be such an egregious waste of energy I would suffer from bad karma for months. I don't want bad karma. 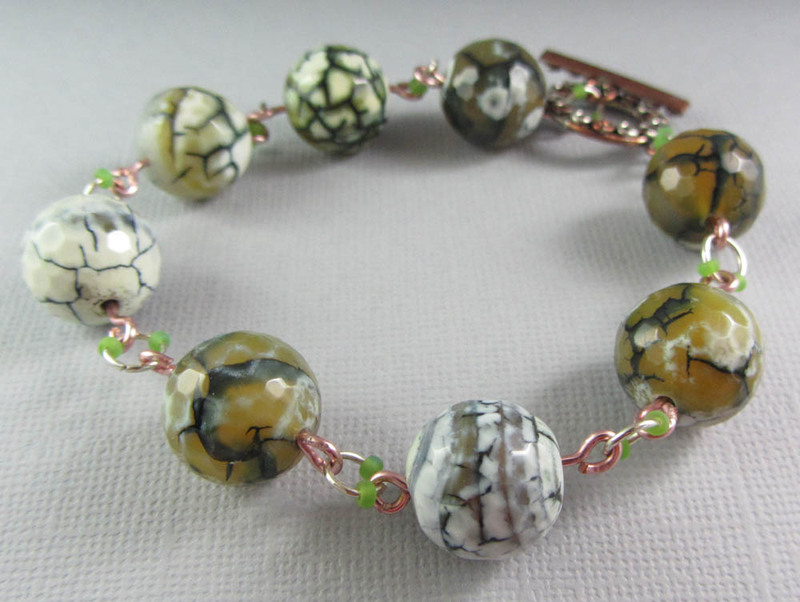 I have fallen in love with porcelain beads this trip. They are my *thing* to over-indulge in this year. And what's better, is that I am supporting fellow handmade artists! 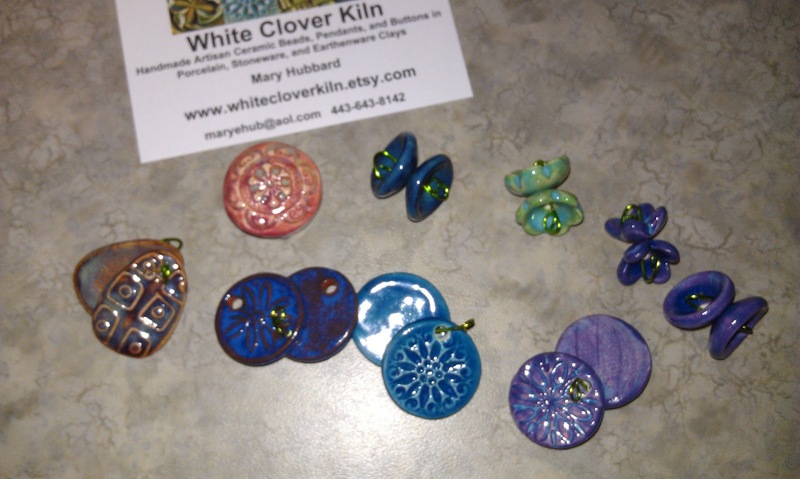 My first haul came from White Clover Kiln (they have an etsy shop)! I just fell in love with the colors and patterns on her pieces and will make some beautiful earrings with her beads. The one salmon colored bead is all mine. I fell in love with it, and will probably just string it on a black cord so it can be showcased as the star it is. My next stash of handmade porcelain were found at Suburban Girl Studio LLC's booth. 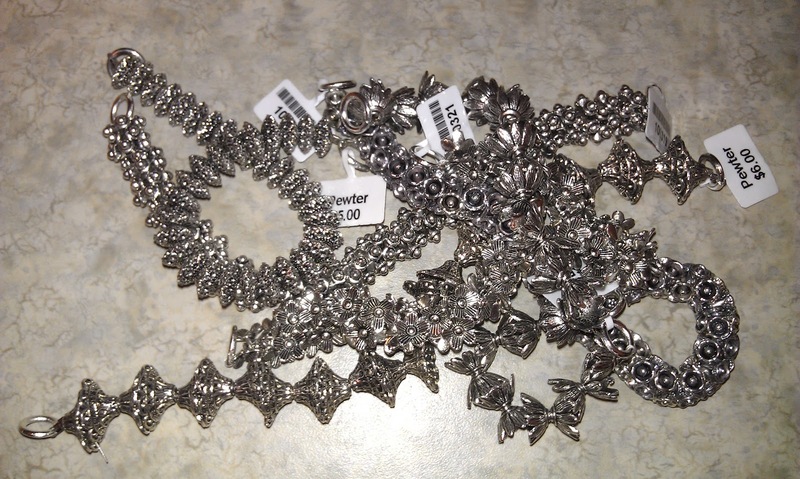 Her beads are so original and unique, and since I love all things Egyptian, I will be claiming the pharaoh head pendant and scarab earrings for my own person stash! I'm thinking of hoarding the paw print pendant as well. I need some new jewelry as much as anybody! I will be visiting a couple more porcelain artists tomorrow--I actually ran out of time today at the show! Next, I picked up a kumihimo kit. Kumihimo is a type of Japanese braiding, which makes a great complement to lampwork beads. I have been wanting to try this technique out for a while, but waited until BeadFest. 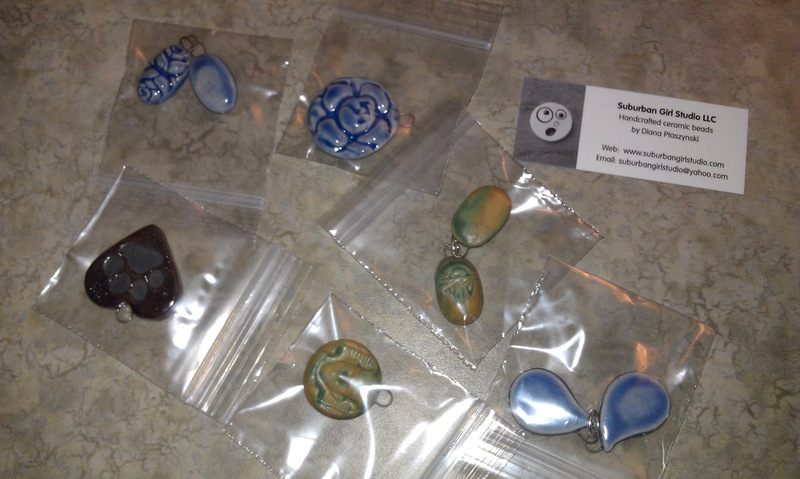 Better yet, I found a artist selling the kits, so even though I didn't get any of her lampwork beads, I was still able to support her! 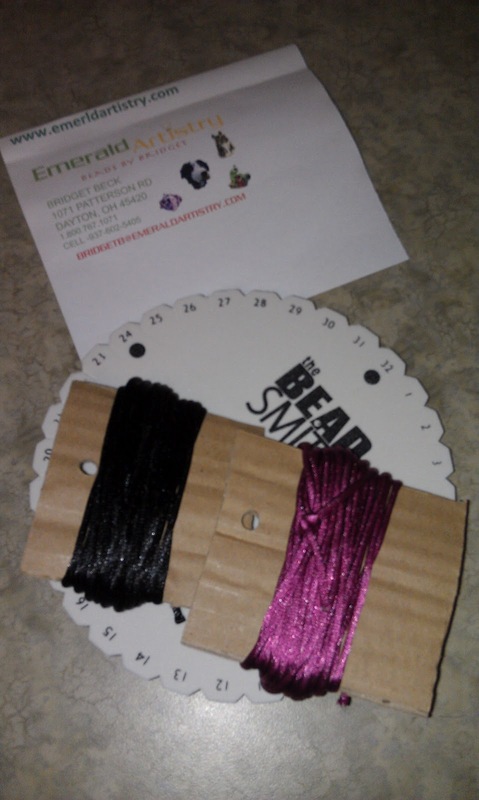 I bought the kit from Emerald Artistry, who makes adorable animal beads! This is only the board and rattail...lots more was in the kit! I also got a few base metal findings, but didn't take pics of those. And of course, I had to hit some of the bigger vendors to replenish my supplies of crystals and a few gemstone strands. 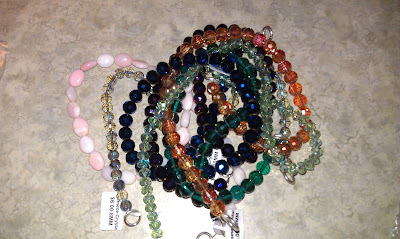 My camera couldn't capture the gorgeous colors in these beads! Some chain, lapis and other good stuff! Tomorrow, I am taking two classes. One on soldering components. 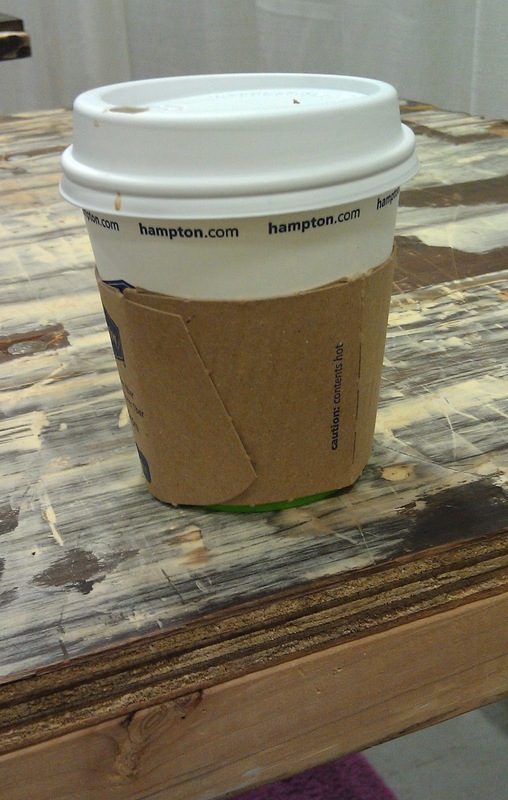 I am a little worried that I may solder myself, since I am running on little sleep, and class starts at 8am tomorrow! 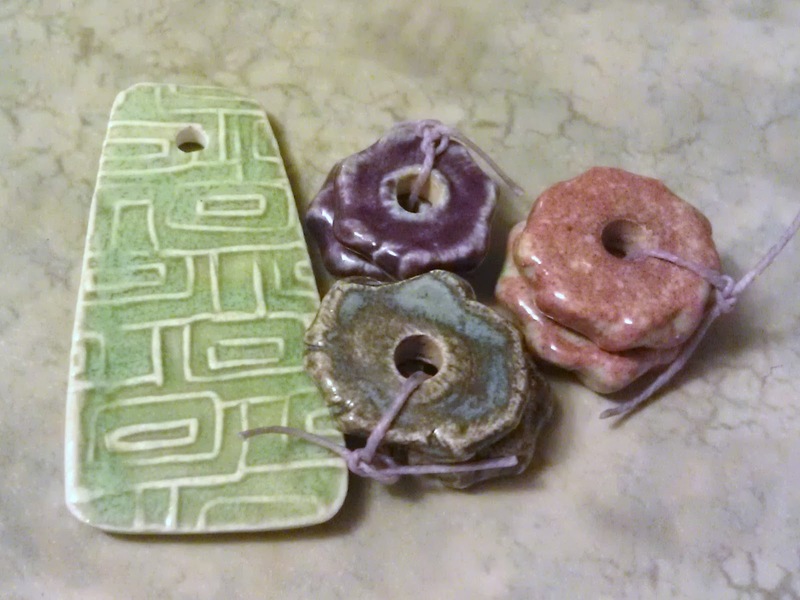 Then, I am super excited to take an enameling class with Gail Crosman Moore! I hope to have some fun experiments to share in the next couple of days! It's time for the 2nd Bead Soup Reveal! The second batch of Bead Soup has been served! You still need to wait until the 28th to see my creations, but have fun hopping the second reveal participants. Tell them I sent you! As for what I have coming up? 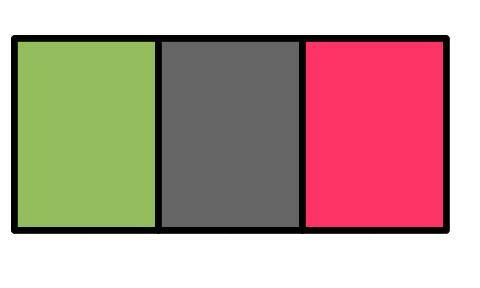 A little tease...color-wise, here are some of the hues you will see in my soup in two weeks!